This is an utterly absorbing and fascinating disc that gave me many hours of pleasure and will continue to thrill for many years to come! 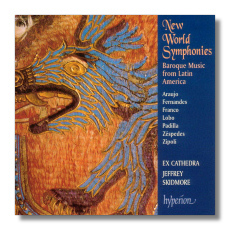 You could not imagine what variety and accomplishment is present in these superb pieces of music that are fastidiously and very well interpreted by the versatile Ex Cathedra under the direction of Jeffrey Skidmore. The most substantial item in this amazing collection is Padilla's Mass which is (strangely) split across various other works. The choral singing is pure Spanish Renaissance and the occasional interpolations by the instrumental ensemble are surely thrilling to listen to. Zipoli is also well represented by excerpts from his Missa San Ignacio and there is also the welcome figure of Alonso Lôbo who makes a distinguished appearance with 'Versa est in luctum', a lovely motet. The rest of the music is also very beautiful and this must now be considered as one of the best discs of the year; on all counts, a superb achievement.